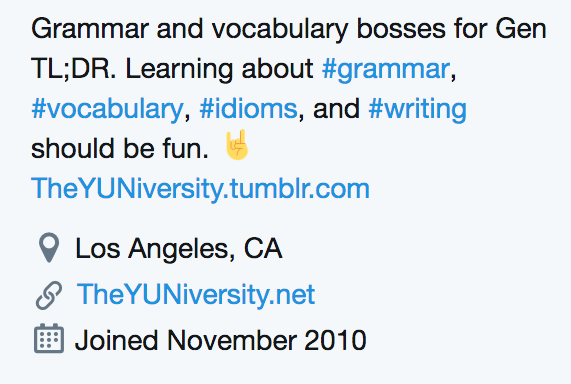 Our Twitter bio says it all: Grammar and vocabulary bosses for Gen TL;DR.
A loose translation is that we write, tweet, and post about grammar and vocabulary in a concise, fun, and simple manner. It means that you won’t have to trudge through a 30-minute article to learn something that could have just as easily been explained in two minutes. It means that pedantry and formality will always take a back seat to humor and pop culture references, because let’s face it: talking about music, comic books, video games, K-pop idols, and anime is a lot more relaxing (and conducive to learning) than dusting off monocles 🧐 and holding a séance for William Strunk, Jr. and E.B. White while sipping on brandy. Our belief is that learning doesn’t have to be overly formal, complete with a proper cup of tea and a classical-music soundtrack—unless that happens to be your thing. (In that case, you do you!) As you’ll see, we value experiences. Nothing compares to an eye-opening realization upon learning something new, or a much-needed chuckle from a cute or funny GIF after a brutal day at school or work. That is precisely what we strive for: learning while having fun. Sometimes, our content is more entertaining than educational. And there’s nothing wrong with that. Congratulations to Nessa Cannon, our writing intern, on publishing her book! 🙌🏻 Please check out And Then There's You on Amazon. Thank you for purchasing our first grammar guide in such large numbers. 👏🏻 If you have not yet done so, you can visit this page to get it. #FACT: For less than the cost of a cup of coffee or a burger you get from a drive-through, you could get our first grammar guide. ☕️ SUPPORT US ON KO-FI.